54 Sqn RAF, West Raynham, 1968. FROG’s Hunter kit is a typical example of late FROG production, with a relatively accurate profile, but little detail or finesse. 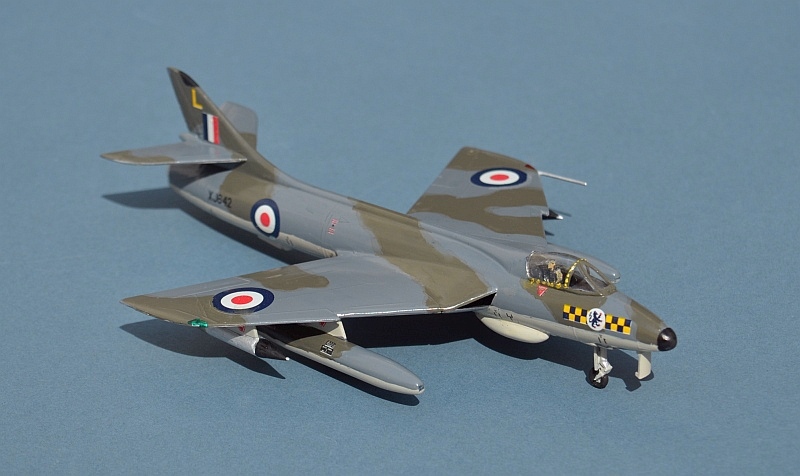 If I had to choose between this and Airfix, I would prefer FROG’s offering, which is a little finer in terms of wing/tail thickness and buildability. It assembles well, with the sole exception of the wing joints, which were somewhat vague in dihedral/anhedral and needed a little filler on completion. 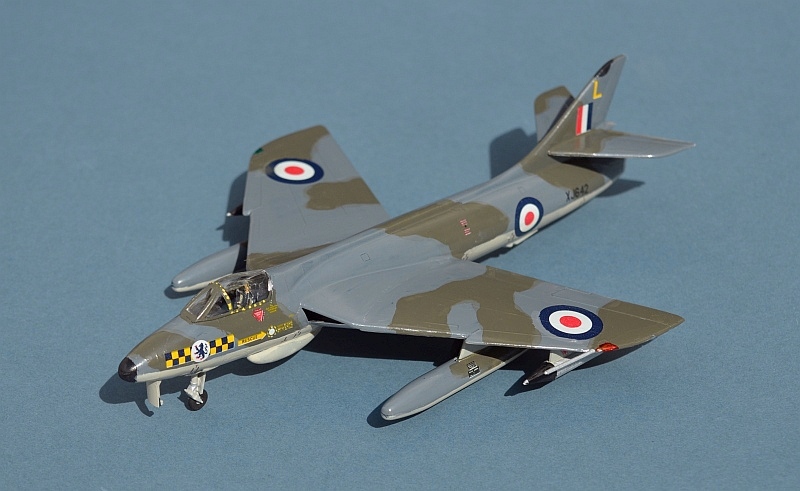 Fuselage detail is lacking, but areas such as the undercarriage are about the same as Airfix. The canopy is a lot more prominent - based on my own photos of the real thing, I suspect that reality probably lies between the two manufacturers. The cockpit is disappointing, with nothing more than a bulky and blobby seat, plus gaping hole into the nose wheel bay (although the pilot figure is OK). I added a better ejector seat from the spares box, and although I toyed with the idea of more detail, there isn’t a lot you can see, so I left the rest of the cockpit “as-is”. The original FROG decals are (typically) good, with just enough stencil detail for this scale. As these must now be over 40 years old, their clarity and ease of application is truly remarkable. Options are provided for the 54 Sqn RAF aircraft and the Swiss 1 Sqn aircraft that features on the box art. 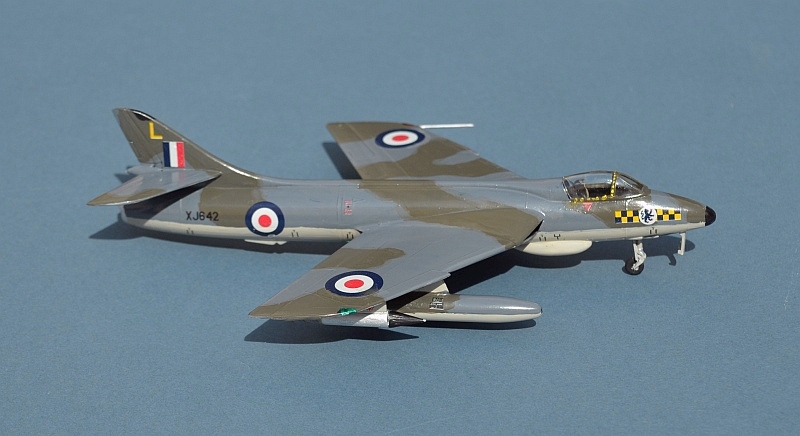 The Hunter remains one of the most elegant jet aircraft ever produced. 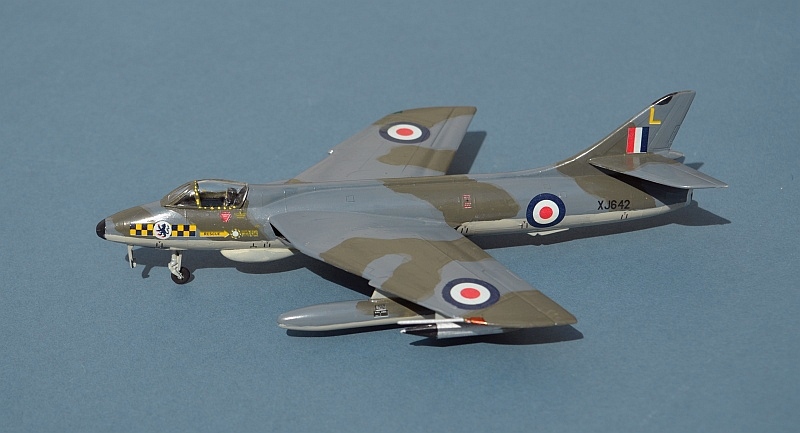 First conceived in the late 1940s, like many British aircraft of that period, its gestation period was extended by a number of political and technical issues, such that it was effectively obsolete as a fighter by the time it was ready for operational service as a replacement for the Meteor, Sabre and Venom in 1954. 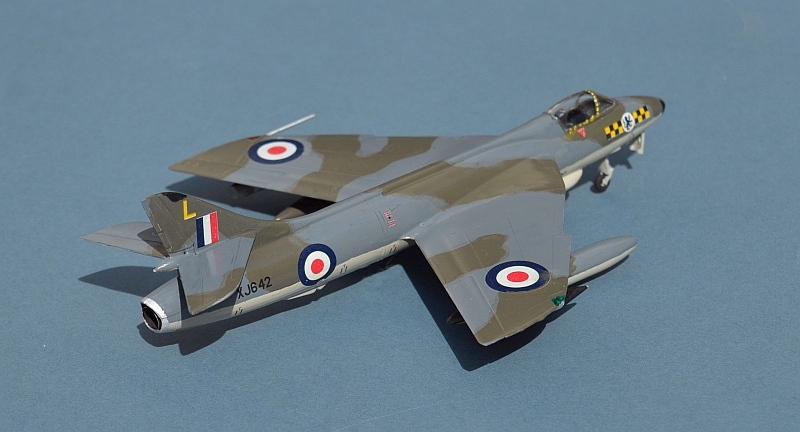 Nevertheless, although subsonic, with a limited radar and weapon fit, the Hunter was quickly recognised as a truly superb aircraft design, and was quickly developed to fill the ground attack role, with additional hard points under the wings for a greater range of armaments. In this guise it was an immense success, seeing active service with no less than 22 nations, including the Lebanese Air Force, whose Hunters remained in active service until 2014. 54 Sqn RAF operated various Marks of Hunters from 1955 until 1969 in a close support role, seeing active service around the world. 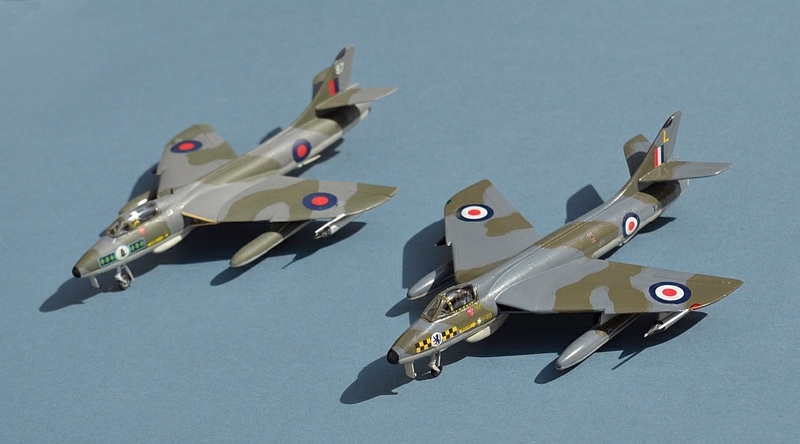 With the rest of my Hunter fleet - the two seaters are Matchbox-based, with the T.8M seeing a lot of scratch-built changes. 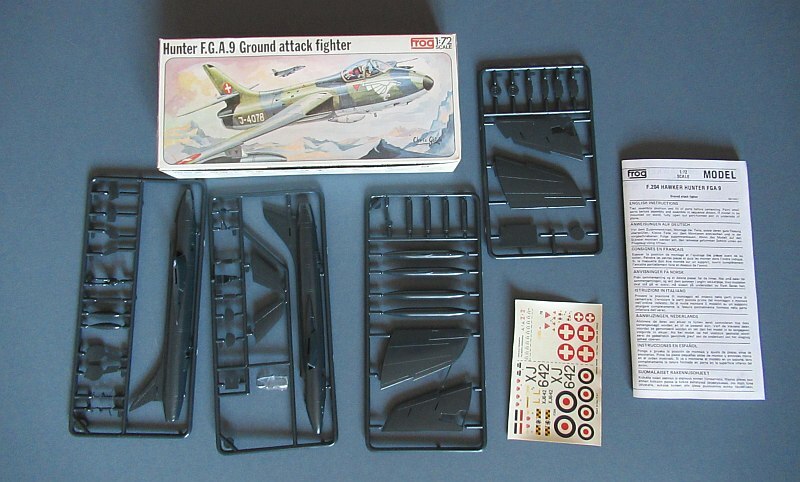 The GA.11 is also based on the Airfix kit.